It is 1940 and Britain is at war with Germany. France has fallen and with Britain the next, and most crucial, country in Hitler's path, the threat shifts to unfamiliar terrain - the skies and an epic battle between the Luftwaffe and the RAF. 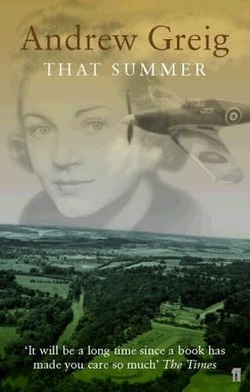 Lenny is a young and inexperienced fighter pilot stationed in Gravesend. After a meeting at a dance with Stella, a radar operator with a more worldly attitude altogether, he falls in love for the first time. She is his eyes on the ground, he is her protector in the air, and as the battle intensifies so their affair gathers pace in an increasingly uncertain time. Class and national barriers lose their distinction and a heady whirl of parties, drinking and promiscuity distracts from the more serious business at hand. Told in intimate, alternate chapters from the perspectives of Lenny and Stella, That Summermatures into a breathtaking novel; a classic love story and a thrilling picture of life during wartime. It is published by Faber & Faber. To buy this book, or to find out more about the publisher, please click HERE.